St. Patrick's Day will soon be bringing out the Irish in us. At South Africa’s Thunderbolt Casino there's a Pot o' Bonus hidden at the end of the rainbow! They're is hosting a treasure hunt this St Patrick’s Day with prizes including a free R2000 no deposit bonus. 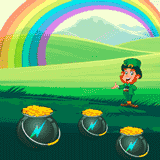 You'll find six pots of gold on Thunderbolt’s St Patrick’s Day page. Move the magical leprechaun to any pot and click on it. Pick the right one and you'll reveal a prize! The first pot hides an up to R3000 casino bonus and 30 free spins on the Lucky 6 slot game from Realtime Gaming. Every other day until March 17th another pot another pot will hide a bonus prize. Redeem each bonus prize in the order they’re found and you can claim the final Gold Pot prize: a free R2000 no deposit bonus. "Isn’t it funny how many South Africans turn Irish every March!" chuckled Alisa, the Casino Manager at Thunderbolt. "St Patrick’s Day is a lot of fun – at Thunderbolt it’s also a lot of prizes!" Thunderbolt Casino offers hundreds of games from Realtime Gaming including the magical leprechaun-themed Lucky 6 slot. Lucky 6 is a 6-reel game from RTG. Four or more Scatter symbols (L, U, C, K, Y AND 6) can trigger up to 25 free spins. Getting them in order and on one line can add extra grouped wilds, turn Pot of Gold symbols wild, and multiply prizes up to 5X. At South Africa’s Thunderbolt Casino, all games are played in Rands and customer service is available in both English and Afrikaans.